Choices Today: Demon Realm or Angelic Realm? … Darkness or Light? Choices Today: Continue the Duality Experiment, or Rise to the Higher Dimensions? Image: Photon Belt … https://doowansnewsandevents.files.wordpress.com/2013/02/photo-belt-3.jpg .. Image: “”Solar System – 26,000 Year Cycle: Orbiting Alcyone & Transiting Photo[n] Belt” … https://www.universallifetools.com/wp-content/uploads/2010/05/Photon_Belt.jpg .. The Photon Belt is a toroidal shaped energy field that emanates from the Great Central Sun Alcyone, in the Pleiades. Our Solar System moves into this field every 11,000 years. For 2,000 years it is bathed in this Light. Then it spends 11,000 years in Darkness. This cycle happens over and over again. Our Solar System’s full revolution around Alcyone is 26,000 years [elsewhere estimated as 24,000 years]. That is 11,000 plus 2,000 plus 11,000 plus 2,000. During this time, Earth spends a total of 4,000 years in Light. These are the two Ages of Light. Earth also spends a total of 22,000 years in the Dark. These are the two Ages of Darkness. 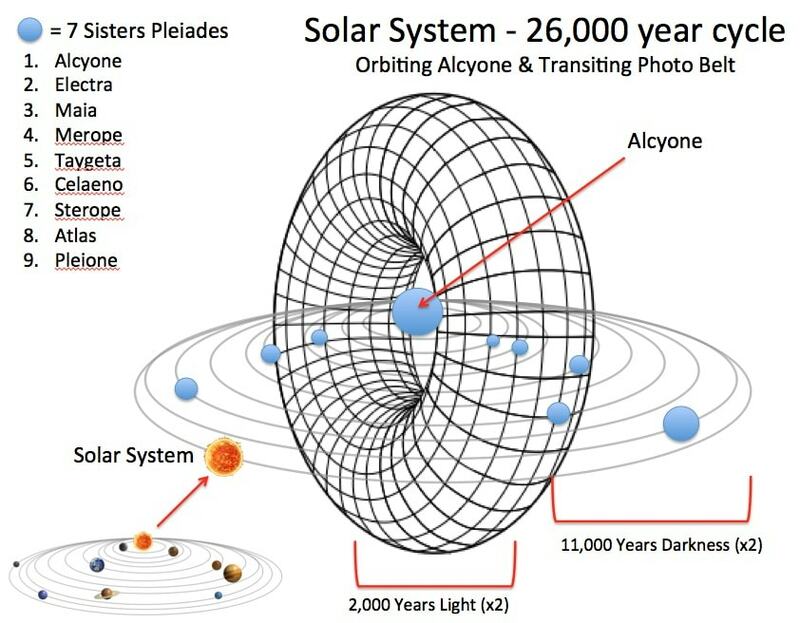 Once every 13,000 years our Solar System is at the peak of the Photon Belt Light; that is, twice in every 26,000 year revolution around Alcyone. NASA attributes this precession to tidal forces raised on Earth by the activity of the Moon and Sun. I really do not know for sure, but I am guessing that this must mean tidal forces of Earth are raised not only by the activity of the Moon and Sun, but also by the lines of Light and force that connect Earth with all of our Star Supercluster Laniakea. Link: “Axial Precession,” in Wikipedia … https://en.wikipedia.org/wiki/Axial_precession .. It is said that our Solar System was last bathed in the peak of Photon Belt Light in the Age of Leo, which saw the downfall of Atlantis. Beginning near the end of the year 2012, our Solar System is once again moving into the Photon Belt. This is January 2016, so we have before us 1996 more years of Light. During this time we will experience a ‘leveling up’ to Christ consciousness as a result of the Incoming Light. –adapted from Link: “The Photon Belt, 2012, and the Wave of Love,” by Simone Matthews, … http://www.universallifetools.com/tag/photon-belt/ .. 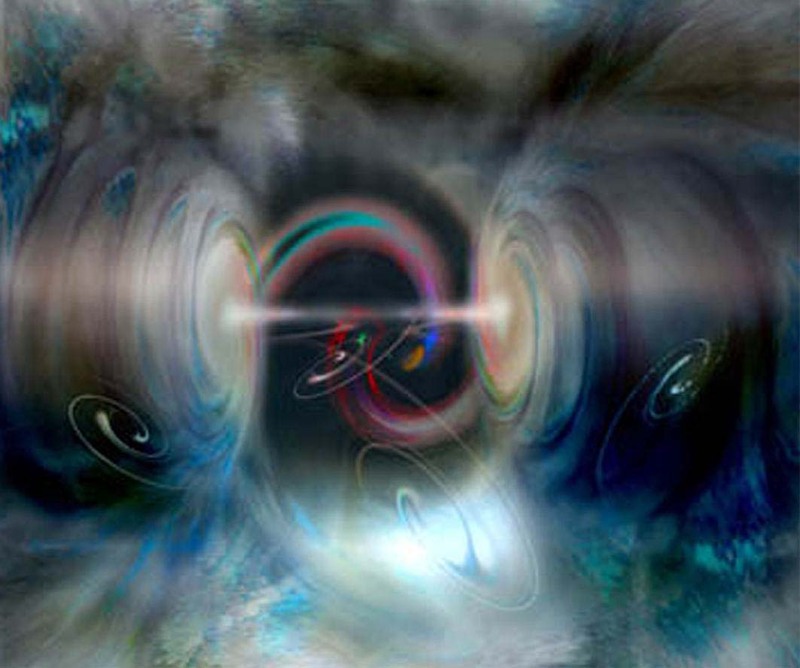 Image: “Photon Band and Spirals of the Sun through Galactic Night” … http://www.futuretg.com/FTHumanEvolutionCourse/Web/Barbara_Hand_Clow/The_Pleiadian_Agenda/img/Fig4.jpg .. The image, which looked a little like a stylized Christmas tree drawing, also showed the ‘outer fringes’ of Galactic Night, during which we humankind have the opportunity to experience, in sharp relief, the contrasts of Light and Dark characteristic of the Duality Experiment. When our Sun, and her planets, are bathed in the Light of the Photon Belt, all her beings, and we as well, experience Christ consciousness. This is the energy of unconditional love that Christ brought to Earth 2,000 years ago, as a grand preview of what we are now beginning to experience. Because our Solar System is located far from the Great Central Sun, Earth experiences longer Ages of Darkness than do the sun systems closer to Alcyone. Thus our Solar System’s method of Soul evolution is known as the Duality Experiment. We Souls who have volunteered for this experiment are anticipated to more quickly gain Soul wisdom because of the many choices of Darkness and Light available to us. During the Times of Darkness we have the choice of two kinds of guides … those of the Demon Realm, and those of the Angelic Realm. We are now emerging from an Age of Darkness; the Demon Realm no longer has power on Earth, and all that is left to be done is for us humans to welcome the Divine Light and allow it to erase the memories of the Dark Times. The sooner we allow God’s grace in, the sooner we will experience His love, Light, peace and joy … which is, in fact, already the state of our own Souls, of Earth and all the planets, of our Solar systems and all the sun systems of this Universe. Earth will be bathed in the Light of the Photon Belt for about 2000 years. We humans have, during this interval, the right and ability to opt out of the ongoing cycles of Duality and return back to one of the more harmonious star systems from which our Souls proceeded since its birth … for example, the Pleiades, Sirius, or Lyra. Or, we may choose, as many have in past Great Cycles, to remain on Earth, anchoring Light here for many Souls who have already chosen to participate in the next cycle of Darkness. For more on our star system choices, you can purchase Judy Satori’s wonderful book “Sunshine before the Dawn” at Link: “Judy Satori” … https://judysatori.com/ ..
LInk: “From Barbara Hand Clow Writings” … https://www.bibliotecapleyades.net/universo/esp_cinturon_fotones_3b.htm ..
Barbara Hand Clow also mentions that the walls between the dimensions [the Veils] become thin while we humankind are in the Photon Belt. Many of us are finding, today, that we must learn or re-learn mastery of the fourth dimension, the Land of Dreams. We can also expect Earth changes and radical weather. According to Barbara Hand Clow, it will be completely up to us what fourth dimensional elements we will attract … see or hear … on the astral plane. Whether it will be angels or devils is completely up to us. This entry was posted in 11 – Galactic body (Milky Way), 13 – Laniakea Supercluster (100000 galaxies), A - My Favorites, Almanac: solstice - equinox - moon cycles, Angelic realm, Astrogeophysics - EMF - hologram, Buddhic or Christ consciousness, Demonic realm, Dimensions - multidimensionality - veils, Duality - polarity, Heart clearing - unconditional love, Human torus, Incoming light - grace - leveling up, Myths of creation, Sirius, Stories - myths - visions - legends, ZZ- Awakening with Planet Earth and tagged Age of Leo, Alcyone, almanac, Ascension, Atlantis, Barbara Hand Clow, central sun, Christ consciousness, dimensions, duality, Duality Experiment, galactic day, galactic night, galaxy, Great Ages, JScambio, Laniakea, Lyra, myths, Myths of creation, photon belt, Pleiades, precession of the equinoxes, Sirius on 12 December 2015 by Alice B. Clagett.